Native American Poltergeist - I mean, The Darkness - is a bland blend of popular paranormal movies that never defines itself. I’ve endured countless horror movies that go absolutely nowhere, but Native American Poltergeist – I mean, The Darkness – might be 2016’s most notorious offender. Even in an empty theater, engulfed by pitch-black silence, only the super-chilly air conditioning could manage to raise my hairs. Influentially, there’s never a question where filmmaker Greg Mclean draws inspiration from, but where other movies simply borrow, The Darkness repurposes. Not blatantly – like Kelvin Tong’s The Offering – but when I jokingly say Native American Poltergeist, the comparison couldn’t be more cut-and-dry. What happens when you blend together Insidious, Poltergeist, and every other paranormal haunter from the last ten years? I have no idea, but this is unfortunately worse. Don’t you hate when your autistic child unleashes a generations-old Anasazi curse? Peter (Kevin Bacon) and Bronny (Radha Mitchell) think their Grand Canyon camping vacation is all fun and sunshine, but their son Michael (David Mazouz) brings home five deadly souvenirs. In Michael’s backpack are mystical stones trapping demonic Anasazi spirits, who he invites into his family’s home. As faucets start turning on and doors fling open, Bronny begins to suspect her house may be haunted. Looks like raising a mentally handicapped boy and a daughter with an eating disorder (Lucy Fry as Stephanie) were only the first challenges for this suburban mother. Can the Taylors drive away the dark spirits who now inhabit their home? Sadly, by the time this house-smashing thunderstorm weakly peters out, you won’t care who lives or dies. And if you did, a lame, anticlimactic ending will undercut any momentum you might have let build. There’s so little worth investing in here, from a weakly fleshed-out dysfunction dynamic to shadow outlines that are meant to be scary. Everything is a wasted opportunity, which suggests McClean might have been forced to make something out of “minimalist” Blumhouse funding – not unheard of for the company’s cut-rate mentality. Unfortunately, budget dollars spent on “big names” doesn’t excuse a plodding, drawn-out story that somehow makes ninety-three minutes feel like a supernatural purgatory. Everyone is exploited as a cliche – Lucy Fry’s unnecessarily rabid teen angst, Paul Reiser’s sharky boss character, Rhada Mitchell’s “NO ONE BELIEVES ME!” depression….you get the point. Slowly, the hand-prints-of-doom take over the Taylor household, until a mother and daughter team of native spiritualists come to drive away the squatting demons (Steven Spielberg got royalties here, right?). We’re talking about a movie that interjects “everything is gonna be alright” conversations JUST as things are about to go belly up, so expect a boatload of schmaltzy genre gimmicks. Like, a King Kong sized boatload. It pains me to see Greg Mclean’s name tied here because Wold Creek (1 AND 2) are top-notch outback thrills. Each film possesses danger and a deranged sense of entertainment. The Darkness, on the other hand, is a tame, contained, and neutered ghost story like the billion that have come before it. Credit Mclean’s team with a few pretty nifty visuals – when storm clouds start swirling above the Taylors’ kitchen table – but besides indoor lightning bolts, there’s never any real payoff. The best dirty hand attacks are all revealed in the trailer, and there’s surprisingly few other instances of horror jumpiness even worth mentioning. This is a production that refuses to go big, yet still ends up going home – the strangest of all cinematic fates. No character is worth investing in. No scare truly chills. No drunken argument achieves wittier banter than a daytime soap opera. No shadow monster is worth such a dull, effortless tale of Native American magic. 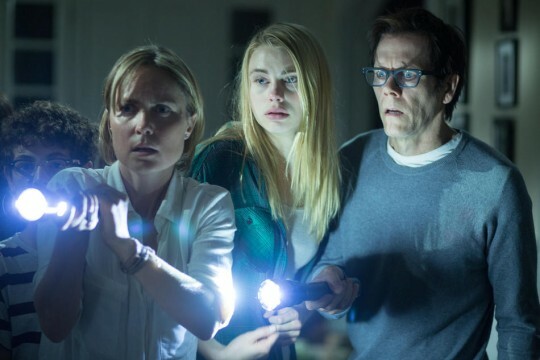 The only intriguing arc materializes when Kevin Bacon’s character reveals a connection between autistic children (his son) and the paranormal, but it’s never truly explained besides some scrolling website text – then it’s back to faucets turning on and off all night. The Darkness is yet another by-the-numbers haunter that never once colors outside the lines and couldn’t end on a hammier, more forgettable note than the bookend it chose. Frankly, I’ve seen everyone involved do such better things, so I’ll just pretend this never happened and go about my day. You should too.